Indices closed the trading session near 1-month low amid volatile session as investors turned cautious ahead of key economic data due for release today. Meanwhile, selling among metal, auto, and financials shares along with weakness in rupee against dollar too dragged the markets. Investors remained cautious ahead of the September index of industrial production data and inflation based on the Consumer Price Index due for release after market hours on Tuesday. 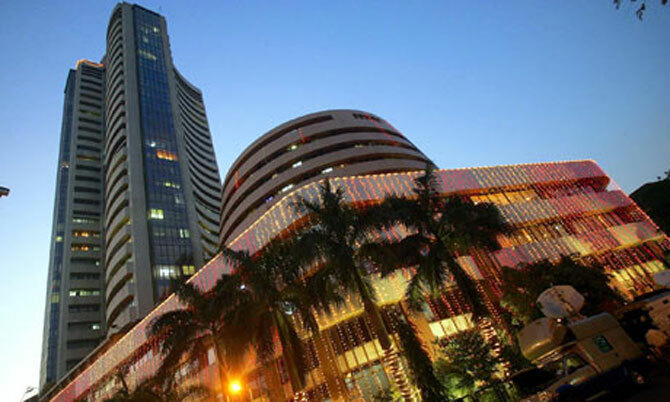 The 30-share Sensex ended 209 points down at 20,282 after hitting an intra-day low of 20,262 and the 50-share Nifty ended 61 points down at 6,018 after touching an intra-day low of 6,012. Adds Pritesh Mehta, Senior Technical Analyst, India Infoline Ltd,” With Nifty closing near day’s low in yesterday’s session and also retracing 38.2% of the previous upmove which we had from 5700 to 6340. Nifty appears to be losing momentum with the formation of Three Black Crows on the daily candlestick. If 6070 is taken out in today’s trade then we can go down to 5900. The broader markets too ended weak-BSE Midcap and Smallcap indices fell by nearly 1% each. The market breadth in BSE ended weak with 1,478 shares declining and 985 shares advancing. Asian shares were mixed on Monday as a surprise surge in US jobs growth heightened worries the Federal Reserve will start reducing stimulus as soon as next month -- boosting the dollar against the euro, yen and emerging currencies. Japanese stocks rose to a near three-week high on Tuesday, as exporters benefited from a softer yen although contractors sagged after their earnings disappointed the market. The benchmark Nikkei share average rose 2.2 percent to 14,588.68, the highest since Oct. 23 and posted the biggest daily percentage gain since early September. At 15:45, the rupee fell to 63.75 versus its prior close of 63.24/25, as investors remained cautious ahead of consumer inflation and industrial output data due at 5.30 PM. Dollar demand from custodian banks is also pushing up the USD/INR pair. BSE Metal, Power, Auto, Bankex and Capital Goods indices slumped by nearly 2% each. Apart from FMCG, all the major BSE sectoral indices ended in red zone. The main losers on the Sensex were Tata Motors, ICICI Bank, Sesa Sterlite, Tata Power, SBI, ONGC, Tata Steel, BHEL, RIL and L&T, all falling down between 1-4%. There was little festive cheer for car makers in October with domestic sales declining by 3.88%, snapping a two-month streak of positive growth as the sector continue to reel under weak macro-economic conditions. Motorcycle manufacturers, however, had reasons to celebrate in October, posting the highest sales volume in a single month since industry body SIAM started collating data in 1997-1998, riding on strong rural demand. According to figures released by the Society of Indian Automobile Manufacturers (SIAM), domestic passenger car sales in October stood at 1,63,199 units as against 1,69,788 in the same month last year. On the gaining side, index heavyweight and cigarette major ITC gained nearly 1%, off day's low of Rs 317. Other gainers were M&M, Wipro and Sun Pharma. Shares of Multi Commodity Exchange of India tanked over 11% to Rs 428 on back of heavy volumes on the bourses. Thinksoft Global Services was locked in upper circuit for third day in a row, up 10% at Rs 235 on BSE after the Germany-based software testing and quality management services firm SQS Software Systems AG (SQS) has made an open offer at a price of Rs 260 per share to the public shareholders. Jai Corp surged nearly 8% on hopes that the company would benefit from development of its Navi Mumbai SEZ after the Maharashtra government on Monday cleared major hurdles for the much awaited Navi Mumbai International Airport project. Britannia Industries rallied nearly 4% after reporting a robust 66% year-on-year (yoy) jump in its consolidated net profit at Rs 98 crore for the second quarter ended September 30, 2013 (Q2). Corporation Bank dipped 9% after reporting a sharp 96% year-on-year (yoy) decline in net profit at Rs 15.48 crore for the second quarter ended September 30, 2013 (Q2) due to higher provisioning towards non-performing assets. UPA vs NDA: Who helped Indian economy the most?